I enjoy architecture and sometimes think it is the height of human achievement. One of the peaks at least, in addition to rocket ships and other forms of transportation. I have some ideas to share about architecture here. The first thing is this old piece I wrote about Oscar Niemeyer around 1999 or 2000. Rest peacefully Oscar. 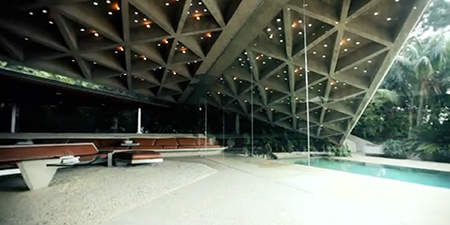 Here's a nice page on the Goldstein Residence over at ISO50. You may recognize it better as Jackie's Treehorn's beachside residence in Malibu. Well it's not beachside and it's several miles from Malibu, but it's even cooler than expected as well.